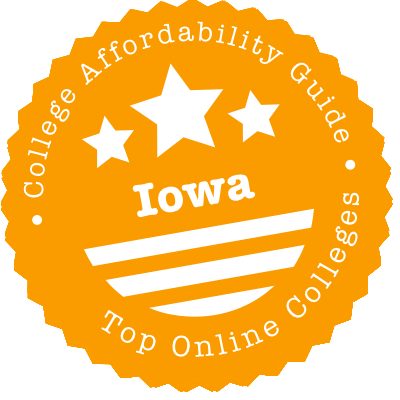 Scroll down to see the top not-for-profit colleges and universities in Iowa offering online degree programs. Des Moines Area Community College has four degrees students can complete through online classwork, including an Associate of Arts in Business Administration. This is a multi-purpose degree that prepares students for an immediate career but also includes the general education coursework a student needs to transfer to a four-year college, giving students the option of seeking a bachelor's degree. Individuals who want business skills without the degree can earn online certificates in accounting, management, or supervision. Potential transfer students who want a major other than business can also earn an Associate of Arts degree online. DMACC On Demand offers some fast-track online classes that students can move through at a fast pace, sometimes as quickly as five weeks. The University of Iowa offers undergraduate and graduate degrees that can be completed entirely online. Online bachelor's degrees include a Bachelor of Applied Studies, a Bachelor of Liberal Studies, a Bachelor of Business Administration, a Bachelor of Arts in Social Work, a Bachelor of Arts in Political Science, an R.N. to B.S.N. program and an R.T. to B.S. in Radiation Sciences. Online graduate degrees include a Master of Arts in Educational Leadership, an Ed.S. in Educational Leadership (with or without Superintendent Endorsement), a Master of Science in Nursing and a Master of Arts in Strategic Communication. Additionally, the University offers six undergraduate certificates, three graduate certificates and one endorsement program online. Some programs include on-campus requirements. The Master of Science in Nursing, for example, requires a one and half day on-campus session for orientation before beginning the program and a one and half day on-campus session for a capstone project presentation at the end of the program. Online students are eligible for financial aid, including undergraduate scholarships such as the $1,000 B.A.S. and B.L.S. Iowa Community College Transfer Scholarship and the $750 Division of Continuing Education Scholarships. Upper Iowa University has been offering self-paced degrees since 1973. No doubt, that early start has contributed to its 2018 ranking of #110 on U.S. News & World Report's list of Best Online Bachelor's Programs. Today, the university offers dozens of baccalaureate degrees via distance education, in addition to four associate degrees. The most represented areas of learning are in human resources, business administration, and public administration. You'll also find an MBA and MPA alongside two other graduate degrees: a Master of Education and a Master of Sports Administration. A reasonable number of undergraduate programs - and a handful of graduate ones - are available as online certificates. Kirkwood Community College has five start dates a year for its online programs, which means students can start working on their degree ASAP. Three complete degree programs are offered online, including a liberal arts associate degree for students who will transfer to a four-year school and an associate degree in business administration in management. The third associate degree offered online is an Associate of Applied Science in Water Environmental Technology, which prepares students for technical jobs in the fields of water and wastewater and includes an internship. Four certificates are also offered in a 100 percent online format. The certificates are all related to business and cover topics such as project management and human resources. Morningside College offers all of the degrees in its graduate program in education 100 percent online. This includes Master of Arts in Teaching degrees with professional educator, reading specialist and special education concentrations. The College also offers various endorsements online, including English as a second language, middle school, reading, music education, talented and gifted, Instructional Strategist I: K-8, Instructional Strategist I: 5-12, Instructional Strategist II: BD/LD and Instructional Strategist II: ID (MD) endorsements. Additionally, several educational strands, or series of courses in a specific academic topic, are offered online. Strands do not result in endorsement but allow students to gain specialized knowledge in areas outside of their major. Online strands include an athletic directors strand, an autism strand, a music education strand and a teacher leadership strand. Online courses at Morningside College are synchronous and do not require proctored exams. Some programs do, however, require in-person internships which can be completed in a student's local area. Online students enrolled in the College's graduate program in education are eligible for financial aid. Iowa State University offers online undergraduate and graduate degree and certificate programs. Online undergraduate degree options include a Bachelor of Liberal Studies and undergraduate certificates in swine science and occupational safety. Online graduate degree programs include M.S. degrees in agronomy, agricultural education, seed technology and business and plant breeding, M.Ed. degrees in curriculum and instructional technology, community college leadership and educational administration, and Master of Engineering degrees in aerospace engineering, computer engineering, electrical engineering, engineering management, human computer interaction, industrial engineering, information assurance, civil engineering, mechanical engineering and systems engineering. Other online graduate degrees include a Master of Business Analytics, a Master of School Mathematics, a Master of Science in Statistics, a Doctor of Philosophy in Apparel, Merchandising, and Design, and a Doctor of Philosophy in Hospitality Management. Both doctoral degrees are hybrid programs that include some on-campus requirements. The apparel, merchandising, and design degree, for example, requires one or two on-campus coursework sessions over the summer, and the hospitality management degree requires two on-campus summer sessions that last three weeks each. Through its participation in the Iowa Community College Online Consortium, Eastern Iowa Community College allows students to earn an Associate in Arts degree completely through online classwork. The A.A. is a transfer degree that covers the first two years of study needed for a bachelor's degree. A.A. students complete most of the general study requirements and take lower-level classes in their major while benefitting from the flexibility of online classes. The college has transfer agreements with several universities, including the University of Iowa and Iowa State, that guarantee all credits will transfer. EICC includes Clinton, Muscatine, and Scott community colleges. Graceland University has online undergraduate and graduate degree programs in the fields of business, education, health care, and religion. Bachelor of Arts degrees are offered in business administration, organizational leadership, and health care management. Online students who have earned an associate degree can also opt for a dual major in business administration and organizational leadership. Nurses can earn a Master of Science in Nursing or a Doctor of Nursing Practice. Nurses with an associate degree or diploma can enroll in the RN to BSN program to complete their Bachelor of Science in Nursing or go from an RN to an MSN. Students seeking a Master of Education can major in curriculum and instruction, differentiated instruction, literacy instruction, management of the quality classroom, special education, technology integration, or instructional leadership. A Master of Arts in Religion is also available. Undergraduate classes are offered in a 100 percent online format and students are never required to come to campus. Graduate students in the School of Nursing are required to attend a two-day focus session held on campus, and seminary students must attend a weeklong program on campus. Students who have earned an associate degree or at least 60 credits of college work can complete their bachelor's degree online through Buena Vista University. About a dozen majors are available online, including finance, health services leadership, and human services. The university also has several online graduate degrees and endorsements, mostly for educators but also including a new Master of Arts in Organizational Leadership. Courses are delivered in eight-week sessions with six start times per year, giving students flexibility in scheduling. BVU was named one of the top 25 online undergrad accounting programs for 2017 by accounting.com. With more than 250 online courses, Indian Hills Community College students can earn some associate degrees or diplomas online. Students planning to transfer to a four-year school can complete an Associate of Arts or Associate of Science online. One of the college's specialties is health care education, and online students can earn diplomas in health care documentation specialist or medical/insurance coding. There is also an online program for an associate degree in health information technology. Future pilots can complete Aviation Ground School fully online, although they need to take on-campus courses and advanced flight training to complete the Associate in Applied Science in Aviation Pilot Training. University of Northern Iowa offers several degree programs that can be completed entirely at a distance, including bachelor's degree programs in liberal studies and technology management and master's degree programs in art education, early childhood education, elementary education, instructional technology, literacy education, technology, music education, philanthropy and nonprofit development, physical education, professional development for teachers, special education, and teaching English to speakers of other languages. Numerous other degree programs can be completed almost entirely at a distance, although some on-campus visits are required. These programs are available in subjects such as elementary education, educational leadership, social work, public policy, school library studies and science education. Distance education programs at the University use both online learning and a desktop video conferencing system called Adobe Connect. Most online programs are completed in eight-week modules that are offered in the fall and spring. Online students are eligible for financial aid as long as they are enrolled in a degree program and fulfill minimum credit requirements. Northwestern College offers online programs geared to adult students, especially educators. Online programs include education master's programs and education endorsements, along with a few programs in the field of health care. The college offers Master of Education degrees online in three tracks: early childhood, master teacher, and teacher leadership. Applicants to the M.Ed. program should have an undergraduate degree with a minimum GPA of 3.0 and a valid teaching license. Students can enter the program at the beginning of any term, so they can start in August, January, or May. Students take one eight-week course at a time, completing two courses per semester. Coursework is delivered in an asynchronous format, so that students can complete the work when it suits them, as long as they meet deadlines. Educators can also earn endorsements in coaching or Endorsement 100: early childhood integrated setting, and a graduate certificate in teacher leadership. Northwestern also has a one-year online graduate certificate in genetics and genomics, which is designed for health care professionals such as therapists, pharmacists and nurses. Nurses with a diploma or associate degree can earn their Bachelor of Science in Nursing through the online RN to BSN program. Allen College offers a Bachelor of Health Science in Dental Hygiene degree that can be pursued online. Students who follow a full-time course of study can expect to earn the degree after two years of continuous enrollment. Part-time students typically graduate from the program within one year. General education credits can be earned from any regionally accredited institution and later transferred towards the dental hygiene degree. A traditional Bachelor of Science in Nursing (BSN) degree is available online, as well as an accelerated RN to BSN program. Allen College also offers a Master of Science in Nursing (MSN) program that can be completed partially online. All the required courses for the MSN degree are available in an online format. However, the different tracks have varying residency requirements. The Nurse Practitioner Track, for example, requires students accepted to the program to attend a three-day residency session each year. Since the college cannot guarantee clinical or practicum placements for non-Iowa residents, applicants to any of the online nursing programs who are not residents of the State of Iowa should consult with an academic advisor before enrolling in any course or program. Iowa is the state of hidden opportunity! Community colleges are opening up their online courses to students in the system. Iowa’s Regent universities are developing 2+2 programs and out-of-state partnerships like Great Plains IDEA. And even small private schools are offering a ton of financial incentives and transfer options to distance learners. In our quick guide to choosing an online program in Iowa, you’ll find details and links to all of these initiatives, as well as practical advice on avoiding unaccredited schools. Iowa Community College Online Consortium (ICCOC) was created to provide educational opportunities to online students at Iowa’s community colleges (e.g. Eastern Iowa, Iowa Lakes, etc.). You can use the ICCOC’s Online Courses & Programs page to search for a single online course or an entire online program. In your search, you’ll see that ICCOC offers a number of “shared” online courses—the instructor may be from any college and students from all partner colleges can participate. The Online Courses & Programs section also has info on transferring course credits and a Course Equivalency Guide for anyone considering transferring to a Regent university (see below). There are three public universities governed by the Board of Regents, State of Iowa: Iowa State University (ISU), the University of Iowa (UI), and the University of Northern Iowa (UNI). You’ll find links to all of their online degree programs and courses on Iowa Regents Institutions Distance Education (IRIDE). If you live in Southwest Iowa, check out the Southwest Iowa Regents Resource Center (SWIRRC). Area residents can use its website to learn more about undergraduate and graduate degree programs and search for online courses at Regent universities. If you live in Northwest Iowa, check out the Northwest Iowa Regents Resource Center (NWIRRC). Like SWIRRC, this website offers the same way to search for online courses. Through the Iowa Regents Course Sharing Initiative, you’re allowed to take certain online courses at any of the three Regent institutions. However, you will still register and pay for course tuition through your home institution. The GradCenter (Quad-Cities Graduate Center) is devoted to helping working professionals and adult learners get access to top-quality graduate education. You can use its Program Search to look for online or hybrid programs offered by GradCenter member institutions in Illinois or Iowa. In addition to master’s degrees, the GradCenter catalog includes endorsements, certificates, doctorates, and individual courses. Want to talk to someone—in-person—about your options? Staff at the GradCenter at Western Iowa University in Moline can also assist with graduate exams (e.g. GRE), professional development opportunities, and more. It’s pretty tough to earn the title of an Affordable Online School in Iowa! To make it onto our list, the following universities and colleges had to meet stringent criteria for quality, flexibility, price, and use of financial aid money. (You’ll see a CAG score next to their profile in our ranking). If you’re debating between two or three schools, we also recommend you check out the useful statistics on College Scorecard. ISU’s Online and Distance Learning website has a full list of its online courses and degrees, including (but not limited to) degree completion programs, non-credit professional development options, and courses in the Iowa Regents Course Sharing Initiative. This site also has a clear breakdown of tuition & fees, as well as links to each School’s distance education arm (e.g. Engineering-LAS Online Learning) and the Office of Student Financial Aid. Thinking about human sciences or agriculture? ISU is a member of the Great Plains Interactive Distance Education Alliance (IDEA), a partnership of 20 regionally accredited public universities across the country. These schools have come together to develop and deliver high-quality online academic programs in those two areas. Students choose a “home” institution, where they apply, enroll in courses, and graduate. But regardless of their location, students only pay the Great Plains IDEA Common Price per credit hour. UI’s Distance and Online Education center has the skinny on its online programs and courses—you can even explore a sample online course. When it comes to tuition & fees, costs will vary depending on your residency status, program of study and semester hours of enrollment. UI’s Registrar Tuition & Fee Tables list the full prices. Better yet, there are a number of scholarships open to distance learners. One of UI’s key strengths is education training—it often ranks in the top 20 of U.S. News & World Report’s Best Online Graduate Education Programs and the top 4o of Best Education Schools. It offers multiple online master’s programs in teaching areas (e.g. STEM, Educational Leadership, etc.) and its research-focused College of Education is both large and well-respected. UNI at a Distance is the central spot for UNI’s online degree programs and its courses & workshops. Tuition rates vary depending on the program, but most online students are eligible for financial aid. The Admissions section has additional info on how to transfer credits, including details on UNI’s Admissions Partnership Program (APP), which ensures a smooth transition from an Iowa community college. But that’s not all! Like a number of public universities, UNI has also developed a 2+2 program for working professionals or parents who want to earn a bachelor’s degree (e.g. 2+2 Elementary Education BA). Without leaving their hometown, 2+2 students can take two years of classes at their local community college and two years of UNI courses (taught by UNI faculty) at either the community college or online. Whether you’re considering an online program or an on-campus degree, make sure your Iowa school is fully accredited by an organization recognized by the U.S. Department of Education. National accreditation may apply to distance learning institutions (including for-profits), but regional accreditation is the best choice—especially if you’re trying to transfer credits or seek financial aid. Formerly known as the North Central Association of Colleges and Schools, the Higher Learning Commission (HLC) is in charge of regional accreditation for Iowa universities and community colleges. It’s simple to search for HLC-accredited institutions by state. The “Public Disclosure Notice” under the school name will tell you if the institution has been placed on notice, sanctioned, or put on probation. Considering out-of-state options? You can check any institution’s regional or national accreditation status using the Council for Higher Education Accreditation (CHEA) Database. Fortunately, Iowa doesn’t have as many problems with unaccredited schools & diploma mills as some other states. But here are a few programs that we have flagged for major quality concerns. AWU is an unaccredited online school that holds no national or regional accreditations recognized by the U.S. Department of Education. It does not appear in the CHEA Database or College Scorecard, and has frequently been called a diploma mill. Its founder was Maxine Asher, a controversial figure who also created the World Association of Universities and Colleges (WAUC) in order to accredit AWU. Kingsway is a religious university that holds no national or regional accreditations recognized by the U.S. Department of Education. It does not appear in the CHEA Database or College Scorecard. On its website, it states that it is a member of the International Association of Bible Colleges and Seminaries. However, this is not an accreditation organization recognized by the DOE. Higher Learning Commission (HLC): Once known as the North Central Association of Colleges and Schools, HLC is the regional accreditation body for Iowa universities and community colleges. Use its website to search for HLC-accredited institutions by state. Iowa College Access Network (ICAN): According to its website, ICAN supports nearly 800,000 students, parents, and education professionals who are preparing for college each year. It also provides one-on-one personal advising sessions in centers around Iowa. If you’re unsure about distance learning, ICAN may be able to help. Iowa College Aid (ICA): ICA’s section on Distance Education/Flexible Learning has a helpful chart of all Iowa institutions (public, private & community colleges) that offer online degree programs and online courses. Iowa Distance Learning Association (IDLA): IDLA is a non-profit association that promotes the development & application of distance learning to education in Iowa. It hosts a symposium, grants distance awards to educators, and provides mini-grants for online initiatives. Iowa Learning Online (ILO): The Iowa Department of Education developed ILO to give Iowa high school students access to high quality online courses. All course teachers are licensed in the State of Iowa with an appropriate endorsement level for the content area being taught. Students can enroll through their local school or district. Transfer In Iowa: Run by the Board of Regents, State of Iowa, this website has some useful advice on how to transfer credits between Iowa community colleges and Regent universities, including details on reverse credit transfers & online degree completion options. GradCenter Program Search: Search for an online or hybrid graduate program at any one of the GradCenter member institutions. Iowa Community College Online Consortium (ICCOC): Search for an online course or an entire online program at an Iowa community college (e.g. Eastern Iowa, Iowa Lakes, etc.) using the Online Courses & Programs page. Iowa Regents Institutions Distance Education (IRIDE): Search for distance education degree and certificate opportunities offered by the Board of Regents, State of Iowa Universities (i.e. Iowa State University, the University of Iowa, and the University of Northern Iowa). The Southwest Iowa Regents Resource Center (SWIRRC) and Northwest Iowa Regents Resource Center (NWIRRC) have similar search engines.